CHICAGO (WLS) -- A major snowstorm dumped 4-9 inches across the Chicago area, snarling traffic and canceling more than 1,000 flights. By Saturday afternoon, the snow had stopped, but lake effect snow is expected to bring more snow -- between 1 and 6 inches -- starting late Saturday into Sunday in Lake and Cook counties in Illinois and Lake and Porter counties in northwest Indiana. A lake-effect snow band is moving from north to south in parts of northwest Indiana with snofall rates of one to two inches an hour. A winter weather advisory is in effect for Porter, LaPorte, and Lake counties until 4 p.m. Sunday. Evelyn Holmes is on the roads in ABC 7 Stormtracker in northwest Indiana. Evelyn Holmes is on the roads in northwest Indiana in the ABC 7 Stormtracker. The most snow is expected to fall between 10 p.m. and 4 p.m. in the Chicago area, and then after 5 a.m. in northwest Indiana. Between 1 and 3 inches are expected in Illinois, and 2-4 inches in Indiana. Some localized areas could get up 5 or 6 inches. Dangerously cold temps are coming Sunday. 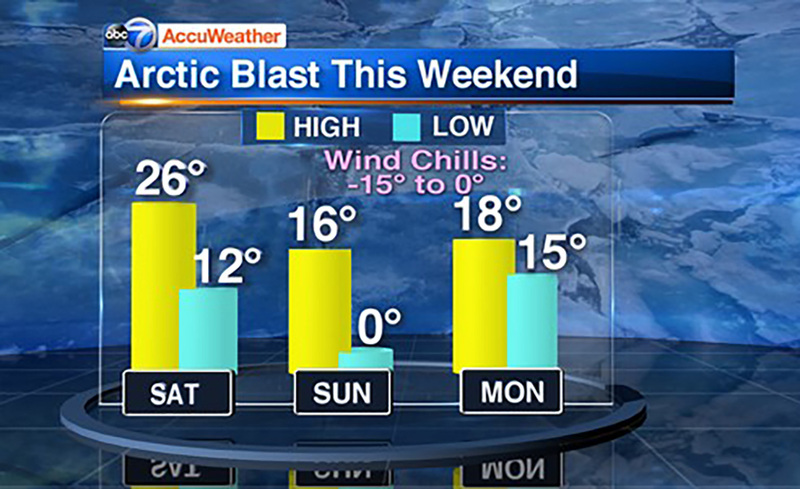 Temperatures are expected to dip into the single-digits on Sunday. A Winter Weather Advisory continues in the Chicago area until Sunday morning. A Winter Weather Advisory will be in effect for Lake County, Illinois, between 8 p.m. and 4 a.m. Sunday. The advisory will be in effect for Cook County between 8 p.m. and 9 a.m., especially along the lakefront. A Winter Weather Advisory will be in effect starting midnight Sunday in Lake and Porter counties in Indiana. The heavy snow impacted road and air travel late Friday and early Saturday as snow and wind gusts up to 35 miles per hour lead to poor visibility and blowing snow. At 9 p.m., O'Hare International Airport reported 1,092 flight cancellations with average delays of 47 minutes. At Midway Airport, there were 78 flight cancellations and a less than 15 minutes delay on flights. A limo slid into the Fox River in Algonquin. Saturday afternoon, a United Airlines plane skidded off the runway at O'Hare. None of the 129 people on board were injured. Saturday afternoon, some of the highest snow totals were in Waukegan (9.1 inches), Palatine (8.5 inches), Northbrook (6.4 inches), Elmhurst (5.8 inches), Midway (5.3 inches) and O'Hare (5 inches). Amtrak warned commuters to check their train status this weekend, as some trains out of Chicago have already been canceled. Chicago officials said Friday it had 350,000 tons of salt at piles across the city and more than 300 snow vehicles ready to clear the streets. Several inches of snow fell Friday night and Saturday morning in Chicago. Several inches of snow fell in Chicago's northern suburbs as part of a snowstorm that dumped 4-9 inches throughout the area. Take a look at the top 5 biggest snowstorms to hit Chicago. With the big snow fall overnight and plenty of schools closed Monday was a prime sledding day! ComEd had said it was increased staffing and getting equipment to prepare for the storm. Anyone who encounters a downed power line can call 1-800-EDISON1 (1-800-334-7661) and Spanish-speaking customers can call 1-800-95-LUCES (1-800-955-8237). ComEd warns you should not approach downed power lines and do not shovel snow onto ComEd equipment. Need help shoveling? Here are some ways to get help without leaving the comfort of your home. The storm moved Saturday toward the Northeast and New England. Some northern parts of New England could see up to 18 inches of snow. The blizzard of 2011 dropped more than 20 inches of snow on Chicago, stranding hundreds on Lake Shore Drive.